Deep inside the depths of the Atlantic Ocean lies the long-lost city of Atlantis – it was once a powerful city full of gold and goods that got destroyed in some cataclysmic events, whose destiny states never to see a man’s footstep on it again. The game has five reels, three rows and 30 paylines. With a top payout prize of 100000 coins on the line bet, the game offers more than it appears. Deep inside the depths of the Atlantic Ocean lies the long-lost city of Atlantis – it was once a powerful city full of gold and goods that got destroyed in some cataclysmic events, whose destiny states never to see a man’s footstep on it again. This is all a product of Plato’s imagination, and this city built on an island never existed, but the legacy that Plato left behind can be seen today, and the treasures that this long-lost city “possessed” are now available to you through this awesome game called Atlantis Treasures Slot. 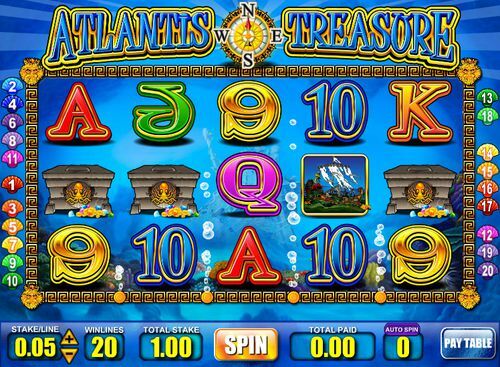 Atlantis Treasures Slot has five reels and 30 paylines that you can spin once you’ve set the denomination which is with a range from £0.20 all the way up to £500.00. The RTP of the game is a bit 95.00% while the maximum amount that you can win is a multiplier of x500. 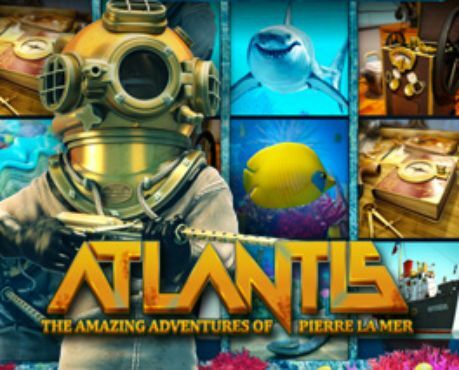 Want to find out more about Atlantis Treasures Slot? Stick around! Atlantis Treasures Slot is one fantastic video slot game developed by not so famous Mazooma Interactive, and with this online slot game, they are trying to propel themselves up among the big online slot developers such as Microgaming, IGT, Net Entertainment and many others that already possess some awesome games like Atlantis Treasures Slot. The game possesses a really nice and unique bonus feature that will most definitely keep you on the reels and make sure you stick around and play the awesome game. On the right-hand side, you will see several of our casinos offering some lovely welcome bonuses. Find the casino that suits your needs and offers the best welcome bonus and claim them with just a few clicks. As soon as you enter the game, you will see how everything is related to the underground and the depths of the Atlantic Ocean. This is where Plato “placed” this long-lost city and island that vanished in the seas. The top of the game is reserved for the name of the game and the logo, as well as one compass that stands proudly showing the directions of this island. On the left and right side of the reels, we can see the paylines, and if you want to see how the lines of these paylines form, just mouse over them and they will appear on the reels. The bottom of the screen is reserved for the features that this game offer like stake/line, number of paylines, total paid amount and other adjustable options, as well as the AutoPlay and Bet Max, features that will make your gameplay way more interesting. On the middle, in between these features, the magical Spin button stands, and that ‘s the button which will bring you a lot of cash! As we said, the whole game is located in the depths of the Atlantic Ocean, and we can see that the reels are transparent and give away everything that is in the background of the reels. They are divided in an interesting way, with underwater bubbles, making sure everything is as lovely as it could get. When seeing the reels, you probably have noticed that the game possesses five reels and 30 paylines. Those reels can be spun as soon as you make a deposit and set the denomination with a wager from £0.20 all the way up to £500.00. One of the cool things that the game possesses is the maximum jackpot offered by Atlantis Treasures Slot, which is a multiplier of 500 – this means that the higher wager you play with, the more lucrative your rewards will receive. To do that with just one click, you can hit the “Bet Max” button which will set the denomination and the coin value all the way to the maximum and it will also activate all of the paylines. This feature is as lovely as it could get, and it will most definitely give you an adrenaline rush, but we have to warn you that it’s one of the most dangerous features in the slot games, as it might lose all of your stake in a matter of minutes – so either come up with a plan, execution or an upper limit for spending before playing this feature, or try the “Auto Play”. On the other hand, the AutoPlay feature will give you a more relaxed approach to the game as it spins the reels automatically with you only setting the denomination and the number of auto spins. Enjoy the beautiful view of the slots, sit back and chill, and watch how the game fills your stake with juicy prizes. All of the features are cancellable if you decide to return to the manual spinning of the reels. 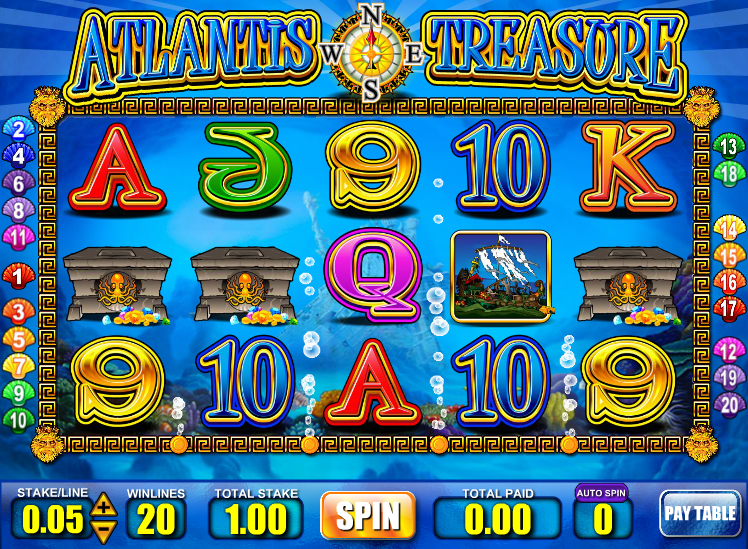 Although Atlantis Treasures Slot is pretty rich design-wise, it lacks some more high-valued symbols. There are only three high-value symbols – a treasure chest, a shipwreck and the game’s logo, while the lower valued symbols are represented by the standard deck of cards inspired symbols including 9, 10, J, Q, K and A. 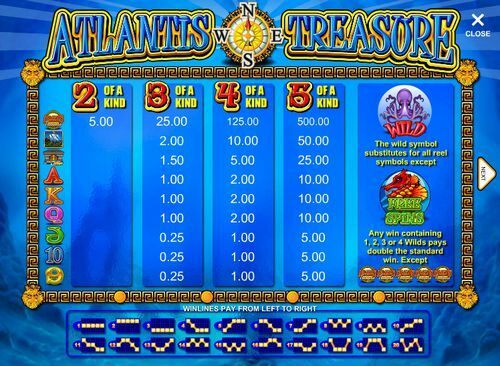 To make things more interesting, Atlantis Treasures Slot possesses a wild symbol in the shape of a purple octopus that replaces the normal symbols and participates in their winning combinations. The red seahorse is the scatter symbol, and it also triggers the free spins feature of the game. All wins during this feature are tripled and the Atlantis Treasure Bonus is still active. Additionally, landing three or more scatters will award more free spins and retrigger the feature. Find a suitable casino to spend your money at, claim the welcome bonuses that it offers and be one of the happy players already spending money they’ve earned on Atlantis Treasure Slot!